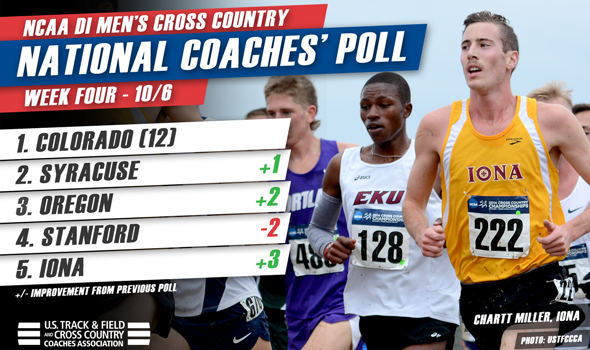 NEW ORLEANS – Following Monday’s eventful NCAA Division I men’s cross country Regional Rankings, it was inevitable that Tuesday’s National Coaches’ Poll would be in for its first top-10 shakeup of the 2015 season. With eight of the top ten teams from a week ago in different positions and two new top-10 squads, that inevitability came to pass in a big way – and it extended far beyond just the top-ten. The two-time defending champion Colorado men remained the unanimous No. 1 with a strong debut at its Rocky Mountain Shootout, but the Buffaloes’ next three challengers lined up in a different order for the first time this season. In fact, 27 of the next 29 teams stacked up differently from a week ago. Stanford dropped two spots to No. 4 with a runner-up finish at the Washington Invitational to new No. 3 Oregon, which improved two spots from last week. Moving up to claim Stanford’s vacated position directly behind Colorado at No. 2 was idle Syracuse. With a month-and-a-half left on the calendar between now and the NCAA Championships in Louisville on November 21, there’s still a significant of racing to be done, particularly by Stanford. In their 52-69 loss to the Ducks, the Cardinal ran without All-Americans Jim Rosa, Sean McGorty and Sam Wharton, and potential All-American frosh Grant Fisher; the Ducks, too, ran without some key athletes in Jake Leingang, Jeramy Elkaim and Blake Haney. Also from the Washington Invitational, No. 9 BYU leapt up three spots from a week ago following a third-place finish. As impactful as the results from the Washington Invitational were on the top-10, the happenings at the Greater Louisville Classic made just as big an impact. Its team champion, Iona, moved up three spots to No. 5 in the country, while runner-up Michigan – led by National Athlete of the Week Mason Ferlic – jumped two positions to No. 8. The Wolverines haven’t been ranked so highly since the 2008 season. Not everyone left EP “Tom” Sawyer Park unscathed, though. Though Wisconsin used the meet as a course preview-workout combination, the former No. 4 Badgers fell seven spots to No. 11. UW finished seventh in the meet as their top four finishers all finished within .03 of one another. Ole Miss debuted its “A” squad at the GLC and finished fourth in a tiebreak, tumbling from No. 13 to No. 19. Though former No. 7 Villanova didn’t compete at Louisville, they, too, dropped out of the top-10 with a poor showing this past weekend. Patrick Tiernan, Jordy Williamsz and Rob Denault went 1-2-4 for the Wildcats at the Lehigh Paul Short Run, but depth was lacking and they were upset by Georgetown. The Hoyas moved up four spots to No. 10. Stanford, Wisconsin and Ole Miss will all have an opportunity to recover in the rankings when they head to the loaded Wisconsin adidas Invitational on October 16. So, too, does UCLA, which finished fourth at Washington and dropped nine spots to No. 20. Elsewhere in the top-10, idle No. 6 Oklahoma State remained steady and idle No. 7 Virginia moved up two spots to its highest-ever rank in program history. Beyond the top 10, UTEP and Louisville had such good weekends that they went from simply receiving national votes to tied for No. 13 and tied for No. 17, respectively. UTEP, powered by a win by Anthony Rotich and third-place Jonah Koech, stormed to the lead early at the Joe Piane Notre Dame Invitational and the six-man roster held on late to claim a victory over NC State, 89-97. This is the first top-30 appearance for UTEP since 2008. Notably, NC State also moved up 10 spots into a share of that No. 17 rank with Louisville. Those Cardinals – up to their highest rank since 2007 – were the third-place team at the Greater Louisville Classic, having a tie broken with Ole Miss in their favor. UL had three of the top 10 individuals in runner-up Edwin Kibichiy, fifth-place Japhet Kipkoech and 10th-place Ernest Kibet. Four new teams closed out the top-30 this week in No. 27 Princeton, No. 28 Columbia, No. 29 Air Force and No. 30 Texas. For Air Force, this isn’t the program’s highest ranking ever, but it is the program’s earliest top-30 appearance since 2005. The 2015 NCAA Division I Cross Country Championships will be held Saturday, November 21, at E.P. "Tom" Sawyer Park in Louisville, Kentucky.